How Do I Get Rid of the Nuisance Algae in My Pond? Cleaning a pond of algae. This question has often echoed in my head, over the wind-tossed treetops, after one of my on-site pond consultations and is probably one of the most repeated questions any pond expert will hear during the course of a day. If I had a nickel for every person who stood there under the hot sun, with bees buzzing on the flowers, kicking the clay with their rubber boots asking me how to get rid of the pesky green slime in their pond I would likely be able to afford that new motor-home I have my eyes on! Thankfully, I have also been able to turn such conditions around and have made a lot of friends along the way as I explain the basics of algae and the easy steps to treat the common problem. Pond owners know that there are two common forms of algae that are bound to show their mucky green faces at one time or another in the life of a pond. Often a pond will suffer bouts with algae many times during a season. While there are chemicals to help knockdown algae my approach is to use natural methods of algae control. This fast-acting product contains several strains of totally-naturally occurring beneficial bacteria which begin instantly breaking down and digesting waste commonly found in pond environments to naturally keep ponds clean, clear and healthy all year long, while utilizing pulverized barley straw to eliminate the need for bulky barley bales, while still providing the water clarifier benefits of barley straw. After treating your pond with any sort of algaecide it is essential to use a natural bacteria to eliminate the dead algae otherwise it begins to accumulate on the pond floor and decomposes which will, with sunlight, release nutrients that cause green smelly water. Using this safe and natural product will eliminate odors, muck and green water. Safe for fish, pets, people and plants! The product contains several strains of naturally occurring beneficial bacteria ideal for breaking down and digesting waste commonly found in pond environments to naturally keep ponds clean, clear and healthy all year long. Breaks down organic sludge like leaves, dead plants, fish droppings, fish food, fertilizer and dead algae. Reduces odors. Harmless to fish, animals and turf plants. After treating your pond with any sort of algaecide it is essential to use a natural bacteria to eliminate the dead algae otherwise it begins to accumulate on the pond floor and decomposes which will, with sunlight, release nutrients that cause green smelly water. Using this safe and natural product will eliminate odors, muck and green water. Safe for fish, pets, people and plants! By results I mean seeing a eutrophic pond that has gone from a decrepit swamp and a mud infested stinking mess into a vibrant and healthy ecosystem. I have literally seen lakes reverse from what looked like an impossible comeback where a bright green, scummy stinky pond returned to her original, or "Oligotrophic", state. No "Oligotrophic State" that is not an unknown State of the Union that we have rarely visited; the Oligotrophic state is a technical term describing a healthy pond which according to the definition are ponds and lakes that are have generally clear water, are fairly deep in relationship to the diameter of the pond and free of weeds or large algae blooms. Green water and floating algae are two of the most common pond issues we deal with. Adding natural bacteria to your pond will help reduce the nutrients that cause algae and turn the water green. There are some strong herbicides and chemical algaecides that are required for certain pond weeds and aquatic plants like duckweed or milfoil. For the more common filamentous string algae you can use less harsh treatment of a non-copper granular algaecide. This fast acting algaecide can kill floating algae within 72 hours or less. After the algaecide has killed the algae it can be manually removed if it hasn't sunk to the bottom already. The algae will turn darker and sometimes from green to brown as it is being eradicated so you will see evidence that the algaecide is working. Adding the natural bacteria, either liquid or dry powder, will help clean up the remnants of the algae that have died so they do not just sink and accumulate as another form of nutrient. Without adding a natural bacteria after treating with an algaecide you risk running in circles always adding more and more algaecide. Adding the pond bacteria every two weeks or so will maintain your pond and this should eventually become your only treatment. Having good circulation or aeration in the pond will help as well. There are natural ways for string algae control that involve a few simply applications so you don't have to toss in three bales of barley straw to get your water clear enough to see the bottom no matter what your neighbor says. Can't get easier than that can it! And if you don't have algae then just go to step 2 and follow the maintenance dosage. Use a combination of of natural algaecide and then a beneficial bacteria to clean up the decayed cells that will be left after the algaecide has destroyed the algae. The recipe we have found to be most effective involves two basic ingredients: First, apply the non-hazardous algae killer and then, 72 hours later, begin treating with natural bacteria to consume the dead algae. WHAT DOES THIS BENEFICIAL BACTERIA DO? Soilfloc® Sealant is the best polymer based sealant available for your canal, irrigation ditch or watering hole. Specifically designed to find leaks, whether in the floor, the wall or through rock formations and seal them. Soilfloc® custom blends linear and cross-linked polymers to seal any type of soil, for any sized project. The biological removal of muck and sludge from ponds, lakes and canals is an ecological way to eliminate organic sediments from ruining shorelines and making swimming impossible. Safe muck eating bacteria are blended from anaerobic bacterial mixtures and enzymes that specifically target the thick, black, stinky muck that is common in ponds and lakes. First of all I am often asked about the make-up of this bacteria and w hile most suppliers treat their recipes as if it were the Colonels Secret Recipe for KFC we can say that these organisms have been deemed appropriate and safe for use in ponds and lakes by the United Stated Environmental Protection Agency and the Canadian Environmental Department because of their beneficial and harmless nature. INCREASED GROWTH AND HEALTH OF FISH - This natural bacteria mixture is comprised of healthful organisms that are natural food for aquatic insects. The bacteria multiplies as it feeds on organic sediment, and insects grow and multiply as they feed on the bacteria. Fish then feed on the insects and grow rapidly as insects are one of the best foods for fish. INCREASED DEPTH - As the bacteria feeds on bottom muck, your pond or lake will deepen, making a better environment for fish, and less opportunity for weeds to grow. Cattails and lilies will not gradually disappear. The beneficial bacteria removes nutrients that many unwanted aquatic weeds are nourished by. Neither cattails nor lilies will gradually disappear by using bacteria, indeed lilies and cattails can provide beauty and add oxygen to a pond and if cattails are a problem as they can be invasive you should do manual removal. Bacteria removes the mucky buildup and this this process is a more economical means of removing organic sediment than dredging and is much more sustainable!. ALGAE & ODOR REDUCTION - Filamentous algae, also known as "pond scum," forms dense hair-like strands that can form thick floating mats. Its growth begins on submerged objects on the pond bottom. As it grows, the algae gives off oxygen that becomes entrapped in the mat of strands. This gives it buoyancy and causes it to rise to the surface where it frequently covers large areas of the pond. Filamentous algae is often a persistent problem because it reproduces by plant fragments, spores and cell division. Treatment with a beneficial bacteria can solve this problem. CG Pro7 is an alternative to algaecides that utilize either copper or synthetic chemicals as their active ingredients. Instead of a copper-sulphate algae killer which also acts on living creatures it is wiser to use a gentler approach. CG Pro7 is a granular product that attacks planktonic and filamentous algae on contact. Through the power of oxidation, the treated algae die within hours of being treated. CG Pro7 is a non copper based granular algaecide that works quickly to control string algae and other types of pond algae. CG Pro7 is an algae killer that works on contact to kill algae and help keep ponds clean all year long. 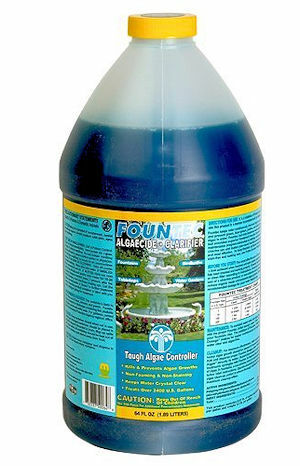 This is a non-hazardous algae killer that is safe for fish, birds and pets once added to the water. CG Granular Algaecide begins working to control algae within 60 seconds of application, with visual results in 24-48 hours. Once you have treated your pond with the required dosage of the algaecide you may notice your algae may appear to get worse! This is, of course, quite a shock to anyone who has purchased a algae control product but it is one of the way that the pesky algae almost wants to have a last laugh with us! As the algae becomes starved from lack of nutrients or begins to suffer the poisonous effects of the granular algaecide then it will often turn dark and float to the surface causing large black mats sometimes of thick dark green algae. Don't worry...this is normal and the pond will clear up. A pond is surely one system where the saying "It will get worse before it gets better" really applies! We've said before patience is a virtue with your pond! After that you have added the algaecide it is time to add a natural safe bacteria to to then devour the dead and decaying algae cells that sink to the bottom. There are many brands of on the market including BactaPUR, Bacterius, PRO Formula Pond Cleaner, Aquaspheres, BarleyBac, BioBac, Nature's Pond Conditioner, Pond Care Pack, AquaClearer Extreme Dry & Liquid, and the list goes on and on. Granted many of our friends from around the world in our travels have had good results with these products and our philosophy is is that if the shirt fits then wear it! We have chosen the best natural pond bacteria product to recommend when we do our on-site consultations. When used in the correct dosages and and when following our guidelines for aeration the results have been 100% successful. Fountec's organic polymers keep fountain and statuary water cleaner, clearer, and algae-free without chlorine and laborious scrubbing. This EPA registered product utilizes a unique control mechanism to kill and inhibit algae without harming the environment. Unaffected by heat, sunlight and evaporation, Fountec also outlasts and outperforms copper, enzyme and quat based products. A small dose of Fountec lasts up to a week or more and is very economical due to its concentrated formula. Fountec is non-hazardous, non-staining and non-foaming. It is safe for birds, plants, and animals but not for fish. Fountec is the most effective product now available for fountain treatment. These days it seems that there is more and more talk of bacteria and friendly cultures and the beneficial strains of harmless single-celled miracle working creatures that can literally save the world! Of course it's great to know ow that our yogurt is enriched with some sort of bacillus that will sit in our guts and cause a blooming rainbow flora within us! Heck, I'm even hearing that toothpaste full of living bacteria is coming and while I may be somewhat open-minded I still don't know if I want to have creepy crawlies on my electric toothbrush! But my point is this; in the last 15 years I've been a professional pond consultant I've seen some truly dramatic results using our friendly ancestors from the Earth! By eliminating chemicals from the equation we can ensure that other aquatic organisms are not harmed in the treatment of unwanted algae. Chemicals are indeed effective at quickly killing algae in ponds and lakes but when chemical agents or algaecides are used we often see damage to beneficial organisms, both flora and fauna, that actually assist in the health and maintenance of a clear and healthy pond. 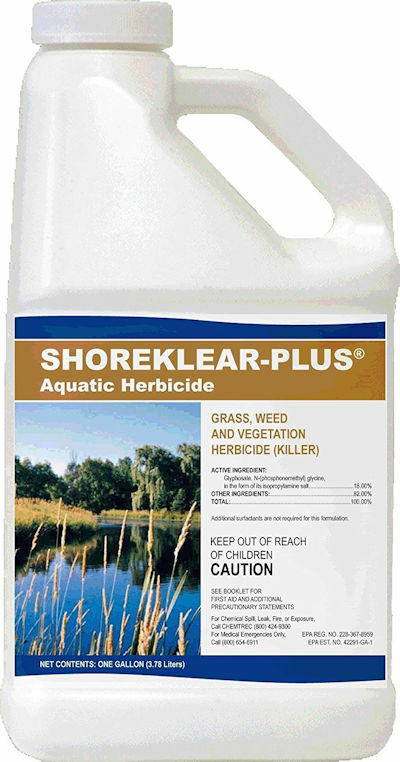 If you are seeking a quick fix chemical solution to aquatic weeds and troublesome algae then it may be best to look elsewhere. Such treatments as copper sulphate are effective but can lead to chemical dependence. Treating with chemicals will often leads to a chemical dependence and this is a vicious cycle of endless chemical applications and damage to the environment. Many pond owners have experience with two primary algae types that are known to haunt many lakes, pond, water gardens, koi ponds and dugouts. There are string algae, also known as filamentous algae, angel hair algae, or horse tail algae which appear as wispy thin green silken hairs that can form thick floating mats and drift and clog along the edges of ponds especially against rocky shoreline structure like rock walls or bridges. Then there are the varieties of plankton and phytoplankton algae that cause green pond water, either a pale green that reduces clarity and forms pond scum on rocks, or a thick pea soup, sometimes an oily-looking layer of thick almost fluorescent green that looks utterly sickening. Of course there are hundreds of algae species that exist in nature and while some of them are the bane of pond builders they are all a natural occurrence that propagates when certain conditions (combinations of temperature, sunlight and nutrients) are right. As with all things in nature there is much that can deciphered by understanding the nature of things. A sudden algae bloom can be a clue to a sudden imbalance in the pond stemming from an influx of nutrients entering the water from lawn fertilizers, a ruptured septic field, or even goose droppings entering the pond! Whatever the cause, it is first necessary to identify the algae and then determine what are the natural conditions and specific circumstances that cause algae to become invasive and troublesome. If the pond is small enough just the best way to remove the weeds or plants is to manually remove it day by day, hour after hour, until there is none left. Of course it is really tough to completely eradicate the problem but you can keep it under control just like keeping the dandelions out of the vegetable garden! You need a net with a long handle or a good quality aquatic rake to harvest this pond weed if you want to deal with this problem naturally or you can look into some carp species that will eat aquatic plants. Aquatic algaecides and herbicides are very effective at controlling unwanted invasive pond species. You should understand that such algae problems, well...it's not really an algae but an aquatic weed plant, if they are treated with herbicides can lead to a dependency or resistance and scientists generally agree that chemical selection pressure that is applied applied to aquatic weed populations for a long enough period of time eventually leads to resistance. This means that while the chemical pond weed killer may work quickly and effectively for the first few years, unless you are adding a positive treatment with aeration and natural beneficial bacteria you will just be "chasing the dragon" so to speak! Written for the serious layperson, The Pond Manual explores the wide variety of pond ecosystems available, and their function; topographic and soil requirements, design and construction techniques, wildlife management, fish species and their cultivation, algae and plant control, parasite problems, chemical and physical parameters of water sources and water control/erosion devices. The string, filamentous algae that is like slowly drifting hairs is often found in stagnant areas of a pond like around the edges where circulation doesn't occur. Ponds with exposed rock shorelines are notorious for becoming warm due to direct sunlight heating the stones which transfer heat to the water. When these stagnant areas become warm and when nutrients are available a slow formation of hair like algae will begin to farm and stick like glue to stones. By reducing circulation and aeration you will reduce the favorable conditions that these algae thrive in so evidence of growth of the filamentous algae should be looked on as a sign that additional circulation or increased aeration would be a good idea. Some backyard ponds and water garden owners prefer to drain their ponds and scrub them down with chlorine bleach or salt mixtures every year to help sterilize the pond. While such cleaning may provide benefits there should be no need to perform such tiresome maintenance operations if a proper ecosystem can be created. Beneficial nature bacteria and barley straw are other ways to assist in the reduction of algae. There are many pond supply websites and stores that sell a variety of products that claim to be strong bacteria or enzymes or natural cultures for clearing ponds and it is best to find a source that can provide references as these sorts of products can be cast in the same light as snake-oil! There can be no denying that there are reputable dealers who can sell a high quality, pathogen free variety of algae busting bacteria but there are also twice as many who sell diluted and homemade bacteria mixtures that are often overpriced and under-effective! When pond water is greenish or that unwelcome pea-soup color it is uninviting for swimming and we cannot see our fish. While not as disturbing as thick mats of algae to have a constant pale green water in the pond can reduce enjoyment of the pond and practically ruin a summer holiday if it continues for over ten days. This green water can be partly the cause of two primary elements required for their growth and propagation: sunlight and nutrients. When we talk about nutrients we are meaning, decaying leaves from the dropping of the Autumn foliage, fish food decomposition, and any sort of phosphate type material from runoff that gets into the water. So we see that reducing these conditions will help maintain clear waters. First by reducing the direct sunlight that hits the pond we can help by stopping the sun's rays from hitting the nutrient rich pond bottom which, especially when low in oxygen, can release algae causing substances. How can you reduce sunlight? Adding aquatic plants like water lilies and hyacinths or by installing a floating islands can provide shade to help cool the water and dramatically reduce the harmful effects of the summer sunlight. Treatments with a professional grade aquatic dye can also radically assist in the demise of phytoplankton. Adding vegetation, floating islands, and treating with aquatic colorant can provide rapid, almost instant aesthetic improvements to a pond and often should be looked on as the first-step, along with aeration, at improving the condition of the pond. Often, the pond owners I have helped, decide to start treating their pond with a bit more respect only after they are in a near panic-state because the condition of things has gotten so worse that they are seeing fish at the surface gasping for air or frogs literally standing on vast expanses of algae! Whether you are starting a new pond or have inherited an old pond or are contemplating the step-by-step approach of a do it yourself pond building project it is never too late or too early to start taking care of the pond; I have seen some literal swamps that were rejuvenated over a few seasons with the proper techniques and all for a lot less money than was anticipated! With an existing pond the first step is to clean as much muck and organic material from the pond as possible. While this is often done the traditional way of draining and excavation, or in small ponds with nets and shovel; it is also possible to treat with specific bacterial cultures that feed on nutrients in pond muck and reduce the available nutrients in the water column. Of course smaller backyard ponds and water gardens can be easily drained and washed and it is a good idea to skim off leaves and other debris daily on your daily inspection of the pond and it never overfeed your fish by using an automatic fish feeder if required. In both large and small basins that use of beneficial bacteria must be considered as a regular part of your pond care program! These friendly cultures do no harm to natural organisms. There are many misconceptions people carry when they hear the word "bacteria" and while there are bacteria that are unwanted and dangerous such as those that can cause illness in fish skin and gills that can kill fish, the good bacteria that we introduce into a natural living pond can break down toxic ammonia, reduce nitrites, control phosphates and literally digest organic muck! These marvels of nature can reduce the amount of pond maintenance that we need to perform by providing a constant cleaning action on the side, bottoms and even the water and plants of the pond or lake. The beneficial bacteria will basically out-compete the algae for nutrients. If you are adding bacteria and seeing no results you may have a poor culture set or the dosage may not be high enough; I've found it is better not to be cheap and look for cheap bacteria because you really will get what you pay for…that being said…you should not have to spend more than a few hundred dollars for a season's worth of bacteria. Shock-treatments of double or triple the maintenance dosage is sometimes recommended and as in many forms of health-care early prevention is the key to keeping algae under control; start earlier rather than later in the season. Often, like a runaway train, once the momentum builds up the algae will really become incredibly resistant to treatment. Remember that adding an aerator, not just a nozzle splashing water from a submersible pump or a small waterfall but a real bottom mounted diffuser system with air stones, aeration discs or diffuser diffuser line, de-icing hose or bubbler line, you will enhance the effectiveness of your added cultures by up to 30% so don't neglect the fundamentals! All living aquatic algae are actually primitive plants! The main difference from other aquatic plants is that algae are defined as having no stems, leaves, or having no real root structures as they commonly exist. There are thousands of species but typically they are found either floating on or near the surface or actually attached to other plants, bottom sediments or debris and even to other real plants! While scientifically speaking there is upwards of 10,000 varieties of aquatic algae, they can all be separated in three fundamental categories: attached-erect algae, microscopic algae and filamentous algae. Most pond owners I know can only separate all the species of algae into two different groups: The algae the ruins their pond and the other stuff they don't care about! The microscopic algae that are sometimes referred to as phytoplankton are free-floating, extremely tiny creatures that give pond water a greenish tinge, or, in the case of a full out bloom, a dark opaque green color. Naturally, a balanced pond is alive and so the existence of the proper levels of such algae is beneficial as they can be the primary dissolved oxygen factories that produce life giving oxygen for other organisms and fish in the pond. Sometimes during warm summer days, especially in midsummer when heat and windless days abound, major algae blooms can occur that rise to the surface and can appear as green or or reddish or even yellow scum. When there is a rapid kill-off of these microscopic algae caused by abrupt changes in water temperature for example, the ensuing death can lead to severe depletion of dissolved oxygen levels and cause severe damage or elimination of other species including fish. Keep a watchful eye on the pond and be prepared to react whenever the lovely pale greenish water tinge, the natural healthy state, suddenly changes into a bright pea-soup! This is a warning sign! In most healthy ponds you should be able to see a fairly bright object clearly to a depth of at least two feet and if a secchi-disc or similar homemade device is not visible before a 24 inch depth is reached it could signify that the pond is suffering from or preparing for an algae event. This is when seeking advice on treatments is mandatory, and, as I stated above, is likely to start with treatments of bacteria, dyes and of course the all-important proper aeration device. What are known as attached-erect algae are not as big nor as common a problem in ponds in Canada or the United States but nonetheless, when blooms of these attached-erect species occur it definitely makes life miserable for swimmers and anyone interested in fishing without losing their lures on the thick mats of submerged weeds. This algae is sometimes referred to as muskgrass, stonewort or sometimes even pond weed, although that is actually a misnomer because even though they do resemble an advanced plant with veritable leaf-like structures spaced plant like on a common stem structure. Before starting any treatment targeting these algae it should be positively identified especially if you are considering a chemical treatment. Again, reducing nutrients and increasing circulation while manually removing the algae is the most natural approach to control. The hair like, filamentous type of aquatic pond algae is the ultimate headache causing nuisance for pond owners in almost all areas of the country as this type of algae is extremely tolerant to cool water temperatures and blooms can begin in early Spring, just when the pond has cleared of ice and the pond owner starts to dream of swimming in crystal clear waters so when this messy muck floats to the surface the effect can be absolutely discouraging. The blooms of filamentous algae are fundamentally born in shallow water areas when waters are clear and sunlight can penetrate and reach the nutrient rich soil of the pond bottom. The conditions of light and food cause cells to rapidly grow and multiply and these cells actually clump together in long strands that resemble green hair, or witch hair as some will refer to it. These hairy masses also grow in almost furry clumps on the bottom of the pond and often break apart and drift to the surface of the water in dense gelatinous mats. These floating algae blooms are very unattractive and can be smelly; not to mention that a sudden die-off of the masses of algae can lead to serious issues within the pond due to the sudden drop in oxygen levels related to the death of the algae. A search on the Internet for algae control methods can bring up a panoply of companies claiming to have the miracle product that will eliminate algae forever! Such claims should be taken with suspicion as many treatments suggested by pond supply companies or pond management companies will often try and attack the symptom only and not the root cause of the algae problem. Because it is a combination of light and nutrients such as phosphorus, nitrogen and carbon that can stimulate algae growth these are the fundamental causes that must be addressed. Reduce the nutrients in the pond and limit the sunlight that reaches the pond bottom and algae blooms can often be kept at bay. If at all possible, try and deepen shallow areas of the pond because when the edges of the pond can be steep sloping with depths of three feet the sunlight reaching the bottom is significantly reduced. Avoiding the use of fertilizers near the pond is crucial as only small trace amounts of any sort of fertilizer can lead to a huge problem. Try and maintain a strip or buffer zone around the pond where high grass or shrubs are left to thrive; this barrier will prevent erosion but also help absorb nutrients. When a pond is edged with a trimmed lawn or decorative rocks there are often problems. Grass clippings enter the pond and sink and decay and create algae food! The rocks can heat up the water and create ideal conditions for further blooms. Keeping a natural, wild looking shoreline is a key to reducing nutrients; changing your habitual use of fertilizers and phosphate enriched products like soaps is also a good idea. If keeping a wide strip around the pond in a natural state is not really an option for whatever reason then drainage ditches and diversion trenches can be installed to redirect any run-off away from the pond. Does it work? Our client feedback says it does. Recently new technologies for algae control have emerged especially within the last five years. Ultrasonic devices claim to be simple inexpensive devices that can control algae in ponds with ultra sound waves that basically destroy the living algae cells. The data on these systems is being gathered and interested clients may find ultrasonic devices existing under many brand names like LG Sonic or Sonic Solutions or other variations. Care should be used when choosing an ultrasonic system for algae control as some devices seem to be designed cheaply of inferior quality leading to complete ineffectiveness or sometimes total failure. Our testing has shown that ultrasonic algae killers are not all created equally and some caution should be used when purchasing these units as there seem to be many knockoff versions flooding the market. One ultrasonic device is from SonicSolutions LLC who have ultrasonic algae control devices installed in a variety of environments including lakes and pond. While the materials of the product may be uL listed and the units NSF rated there is little proven documented science from reputable studies that conclude with certainty that any of this is anything more than "snake oil". Just because SonicSolutions ultrasonic devices require only 24 volts DC to operate and are therefore considered intrinsically safe by the manufacturer doesn't mean that rigorous scientific testing has stated this. These units, because of their mechanical ratings, are installed in ponds and lakes teeming with wildlife as well as wastewater facilities, drinking water reservoirs (they are also NSF61 Certified for their SS-400, SS-500 and SS-600 models) and golf course ponds, just to name a few. Often sonic algae control companies also suggest using their products in tandem with chemicals or bacterial additives. There is the chance that this could confuse the issue of which treatment is actually working. With little empirical proof or publish literature from respected experts it should be a technology to be looked at with some doubt. Ask your ultra sonic dealer for scientific proof of effectiveness and and don't just listen to the sales pitch or read the glowing reviews off of the promo literature the salesman pitches to your Lake Association. Their systems are even used at a number of U.S. government installations including a Navy Base and physics laboratory. One of the unique features of their ultrasonic technology is that, unlike chemicals or bacteria, clients do not need to continually manually reapply our technology. Contact SonicSolutions directly and they can can share with you a number of reports from their customers which include: The West Virginia Environmental Training Center (a division of the West Virginia Department of Natural Resources) who conducted tests this summer and can testify to the effectiveness of the ultrasonic device in reducing algae in a wastewater environment. One of their first customers is Marlin Dise at Winterthur Gardens in Winterthur, PA who has more than 4 years of operating experience proving the effectiveness of the SonicSolutions devices which have completely eliminated the need for any copper based products. Be careful of sonic systems which claim great results. We have seen bad reviews from clients who have seen algae literally grow on the transducer! Just like the SolarBee which relies on intense marketing to promote the product you should beware of the claims of solar bee and ultra sonic devices as they have been showing poor algae killing results. The solarbee system has been touted as a cure for aquatic weeds and many municipalities use the solarbee system based on marketing of the system but the results have been poor and we do not recommend these systems. Why not just use chemicals? When there is a serious and overwhelming infestation of algae pond owners often look to take dramatic and decisive action and many turn their thoughts to algaecides or chemicals; they work on garden plants so why not use them in the pond? Most algaecides are formulated with copper-based mixtures such as the well-known copper sulphate or the copper chelate communes and a variety of brand name algae killing chemicals. Because chemicals are extremely toxic and designed to kill real care should be taken if they are used and I always avoid using chemicals. In many Canadian provinces the use of herbicides and algaecides is not legal and there are strict restrictions in the USA as to the use and application of these chemicals and with good reason. Chemicals can definitely kill algae but there is often unwanted collateral damage. Chemical treatments are notorious for killing more than they were supposed to and if a sterile, almost dead, pond is desired than chemicals is the choice of treatments. Fish can experience toxic reactions to many chemicals if the dosage is exceeded even by small amounts, not to mention the potential for birds and aquatic plants to be affected by the chemicals. Ponds often become chemically dependent if the only form of algae treatment is chemically based. The algae are killed, sink to the bottom, decay and are converted into fresh nutrients which then re-bloom and the cycle continues. Instead of entering into this cycle of poor pond management it is best to treat the pond naturally and, if necessary, over a few seasons instead of trying to solve the problems in one weekend! A healthy ecosystem, whether it is a small decorative pond or a large lake, is dependent on a balanced community of life living in harmony. From microscopic algae to plants, frogs, fish, salamanders, insects and birds, a healthy pond is teeming with life and has a healthy food-chain and maintaining and encouraging this cycle is the key to keeping a pond clear and clean. If the base nutrients, the microscopic beneficial bacteria, are not present in adequate numbers then the pond can age and decline quicker than normal. There are cold water bacterial treatments designed for bottom muck and dry bacteria cultures designed to clear green water and help combat algae growth and when either of these problems are a concern then adding microbes into the pond should not be ignored. Because a pond suffers from two basic types of aquatic pollution, soluble and insoluble, it is key to control these two forms as best as possible. The main soluble pollutants come from erosion and seepage that washes fertilizers, nitrogen and phosphorous into the pond. Aquatic plants will naturally convert via photosynthesis inorganic carbon dioxide into fully organic material. When these plants die they can contribute to the formation of sludge and pond muck which can result in noxious elements like hydrogen sulfide and ammonia being released into the water; a danger to fish and other life. Low oxygen levels caused by these subtle changes causes sediment bound phosphorous to be released and these conditions will often lead to fish-kills and algae blooms. Large lakes with heavy loads of pollution and low oxygen levels are often plagued by regular blue green blooms of cyanobacteria. The stresses caused by such problems can reduce fish growth and diminish the abundance of beneficial organisms and the results are often catastrophic as far as many pond owners are concerned. Proper design, proper maintenance and a constant appreciation and respect for the natural forces that exist in our ponds, whether man-made or existing is essential for forging a positive and healthy approach to pond ownership. Understanding the relationship between living cells, oxygen, light and the positive energy that radiates in all of nature is crucial to understand that maintaining a healthy pond is much like nurturing a child or raising an animal; there are certain steps we must follow and certain traps to avoid in order to assure an outcome that can be appreciated for years. Getting rid of the algae isn't too difficult. We don't use chemicals like copper products as this can create a cycle where the algae dies and then sinks and then decomposes and this causes more algae to grow and then you have to add more chemicals! This is a waste of money and can also damage your fish. We like to use natural bacteria products that are not chemicals but concentrated natural bacteria that consume organic materials in the water...this reduces algae and over time your pond won't be affected with algae. Always make sure you have good circulation or aeration as this helps too. I would recommend two products for your pond, you can buy them on our secure online store, and we can ship them directly to you! "Using blue dye to color water and discourage plant growth is not something new. Golf courses have been using it for years and now fishpond owners are starting to use it. Plants need light for produce photosynthesis and growth but not just any light. Light in the red and blue wavelengths are critical for growth. Application of blue dye does not reduce the light available to the plants. Instead, it acts similar to a blue filter on a camera, restricting all the blue light entering the camera. With this dye in the water, light enters all the way to the bottom but the blue light is absorbed and not available to the plant. This results in submerged water plants being unable to properly photosynthesize and grow." "Cyanobacteria is a modern term used to describe a group of bacteria that, in the same fashion as algae and plants, convert sunlight and nutrients into energy required for growth and reproduction. Because they share many similarities in overall appearance, nutrient requirements, and habitat with algae, cyanobacteria were historically classified as algae and are still commonly referred to as blue-green algae." "For ponds, consider a mix of emergent, submergent, and floating species. Emergent plants, those that have their roots in the water but their shoots above water, can be added to the margins of pools. These include cattails (Typha spp. ), arrowhead (Sagittaria spp. ), and water lilies (Nymphaea spp.). Submergent species, or those that remain under water such as elodea, are often used as oxygenators. These are plants that remove carbon dioxide from the water and add oxygen. These plants are essential in most ponds to keep the water clear. Floating species or those that are not anchored at all in the pond include plants such as duckweed (Lemna minor), water lettuce (Pistia stratiotes), and water hyacinth (Eichhornia crassipes). While attractive, water hyacinth and water lettuce can be serious weed problems in the south; however, since they are not winter hardy, there is no problem with them spreading in northern climates. While not as effective as oxygenators, these plants help keep the water clear by limiting the amount of sunlight that algae receive. In tiny ponds created in barrels and similar containers, these plants may be adequate to maintain clear water." "Herbicides provide temporary control of nuisance aquatic vegetation. Alternate methods such as mechanical removal (Submergents), dredging or substrate alteration (drainage ditches) can provide longer term control. Management techniques for vegetation control in ponds include minimizing nutrient input, dredging excess sediment, logs and other organic debris, decreasing the surface to depth ratio and increasing the rate of pond turnover (flushing). Some aquatic plant and algae life should be accepted and tolerated as a vital component of a healthy ecosystem." "Although aquatic vegetation can provide a variety of benefits to both a pond and pond owner, it can also be a nuisance when it becomes too abundant. Overabundant vegetation can prevent good fishing, inhibit domestic or agricultural water uses, and ruin the appearance of a pond. Excessive algae can lead to summer fish kills and dense submerged vegetation can contribute to winter fish kills. Decomposition of plants can cause water to smell. Dense vegetation can attract insects and unwanted animals. Fish production can be reduced when thick vegetation prevents effective predation of small fish by larger fish. Swimming, boating, and fishing also become restricted if plants become too thick."